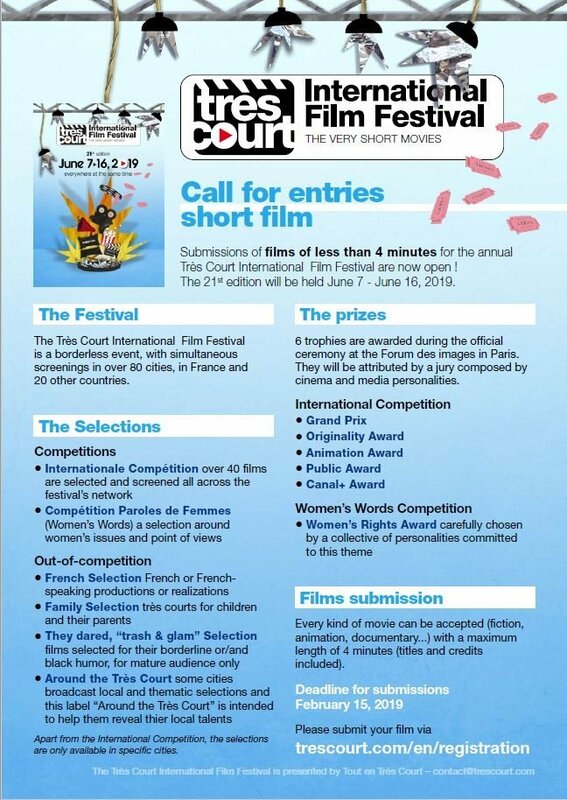 Tres Court International Film Festival – Call for entries! The Très Court International Film Festival is a borderless event, with simultaneous screenings in over 80 cities in France and 20 other countries. Scheduled to take place from 7 to 16 June this year, the most important part of the Festival’s program is the International Competition, where films of less than 4 minutes representing the best and especially the shorter of the global audiovisual production year are presented each year. Another competition is the Paroles de Femmes (Women’s Words) which is dedicated to woman. It is created by Katia Martin Maresco in Montpellier and distributed in the network of the festival.